“Despite what critics maintain, anytime you lengthen a boat, you improve its performance,” PAE vice president Jim Leishman. Pacific Asian Enterprises (PAE) is pleased to announce the latest addition to its product line: the new Nordhavn 475. The Nordhavn 475 will be based on the hull of the Nordhavn 43 but she will be a much different boat, starting with a completely new deck and flybridge. The N475 represents the sleeker, elongated look of modern Nordhavns with the incorporation of an extended cockpit and boat deck, providing not only a more streamlined profile, but also allowing for greater space in the cockpit and more room up top for toys and a bigger tender. The N475 follows in the footsteps of the Nordhavn 52, 60 and 63, 68, 76, and 96 models all of which expanded upon existing hulls and wound up being the more desired model. “Despite what critics maintain, anytime you lengthen a boat, you improve its performance,” says PAE vice president Jim Leishman. The needs and desires of Nordhavn buyers have changed since the first Nordhavn was built nearly 30 years ago. Along the way, we’ve adjusted our product line to correspond with the times, and now as we close in on the launch of the 600th Nordhavn, we’re once again modifying our model line-up. With the introduction of the N475, she will become the smallest of the new-build Nordhavns available, making obsolete both the Nordhavn 40 and the Nordhavn 43, whose molds will soon be destroyed. Like the N43, the N475 is being built at the South Coast factory in China. 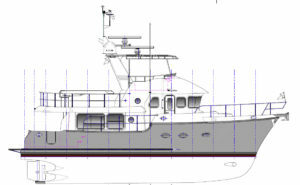 Tooling construction will be underway shortly and the first hull is already sold. d Vent lines are fuel certified, reinforced hose 1.9 cm (3/4″) I.D. d 12v DC power for radios via a 70 amp – 24v to 12v converter.